The ACLU does not like a CROSS that has stood on federal lands in the Mojave National Preserve as a memorial to our soldiers of WORLD WAR I. The memorial has been in place since 1934. The issue is whether the government can maintain a cross, a religious symbol, on federally-owned property, or does it violate the 1st Amendment, prohibiting the establishment of a religion. Sadly, during this dispute, the cross has been covered up. My question is– Have the ACLU members been to Arlington Cemetery?, Or is that next on their list? Might I suggest that they contact the Congressional Research Service office to get a full history of “religion” in the formation of our government. Of special note: Our children cannot begin their school day with prayer, or our sports events with prayer, but each daily session of Congress begins with a prayer! Well, I think that they shouldn’t begin every session of Congress with prayer either! Just because one place does it doesn’t make it ok. Also, what do you mean by the “full history of religion” in the formation of our government? I certainly hope you mean how our Founding Fathers were agnostics and didn’t want any religion in our government whatsoever, having seen what kind of ruinous effect it has on the rationality and common sense of leaders throughout history. And while I take your note about Arlington Cemetary, you must remember that Arlington Cemetary is a place where our fallen soldiers go to rest and they should be given the right, just like every one of us, to be buried in any way they choose. 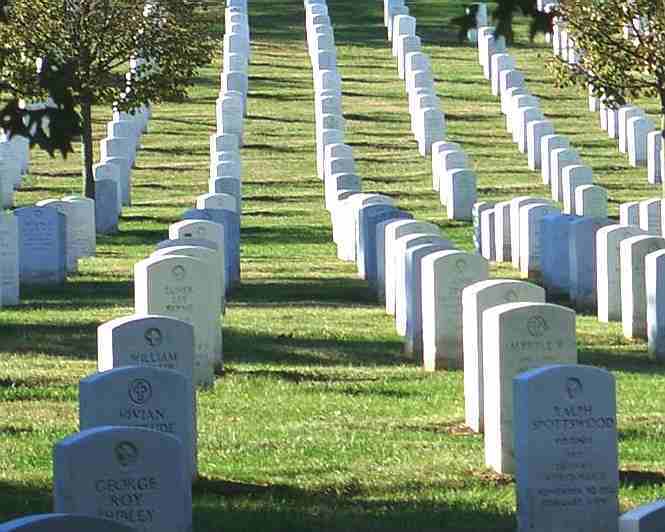 Cross or no cross, even if it is federal land, Arlington Cemetary is something more private and special. Our ForeFathers were not agnostic. They were against the establishment of a National Religion, such as the Church of England. The concept of separation of Church and State is not found in the Constitution or Bill of Rights. It is only found in a letter written by Thomas Jefferson to a Presbyterian minister, acknowledging the fact that we would not establish a national religion. What I meant by religion and its place in the formation of out government, the history speaks for itself. During the Constitutional Convention, after about 5 weeks of debate, Ben Franklin asked why they had not sought “divine guidance” in their deliberations, and from that moment until today, the Congress begins the day with prayer. The Capitol Building had church services held there weekly until shortly after the Civil War. Thomas Jefferson attended the nondenominational services regularly, going to the Capitol on horseback, whiles his successor, james Madison attended regularly arriving by horsedrawn coach. Thus your synopsis of the founding fathers and rekigion is off the mark. I again suggest you contact the Congressonal Research Service, as they have compiled an exhaustive file on the matter. Who is this 75 year old cross bothering in the vast acreage of the Mojave National Preserve? Cardiff, What Great Men Think of Religion. What say you, sir, to that? Forefathers ……..Agnositc?? So u are speaking for ALL of them then huh? U could NOT be more wrong. This country………UNited States of America was founded on Christianity. Read the Constitution…read the Bill of Rights…….even the National Anthem …..all of these..and more of our basic history where God is mentioned numerous times. Its insulting for people like you to say our forefathers were agnostic…and maybe if you’d educate yourself just a little…you’d find out that …that statement is cruel..and wrong. If a person is agnostic, or has a different faith belief…so be it…but to put down the U.S. History with such lack of knowledge is appalling. Whats next…taking all of our faith systems away so the president can slide Islam into our lives/homes??? I THINK NOT!!!!!!!!!!!!! Many misinformed people think the 1st ammendment prohits the use of crosses and other symbols on public land. NOT so. The 1st ammendment ONLY prevents the government from establishing a religion or designating a national religion, similar to many islamic countries. Placing a cross on public land DOES NOT establish ANY religion., especially the Mojave Cross. It is a symbol that memorializes the dead of all wars, much like the VietNam wall does. it is nothing more or nothing less than that. Tim: That is my analysis as well. Way to go Tim……….great answer………..GOD BLESS YOU, AND AMERICA!!!!!! Prohibiting the establishment of religion IS the Separation of Church and State. Don’t post replies if you don’t know what you’re talking about. Again: if you don’t know what you’re talking about, don’t comment on a subject. The Founders all religious? Please. Benjamin Franklin doubted Jesus’ divinity and Thomas Jefferson cut up the New Testament removing all references to Jesus’ miracles and divinity and reassembled it. It’s called the Jefferson Bible. Can you imagine the Christian conservative outrage if a modern president did the same? But I agree with the sentiment that the First Amendment was a prohibition of the FEDERAL government of establishing an OFFICIAL religion. (Were it not for the 14th Amendment which applied the Federal Bill of Rights to the states, we could have official state government religions; and I say good! Let the fundamentalists go to Kansas!) Modern liberals are iconoclasts, scouring the countryside just waiting and hoping to be offended so they can purge every last cross. I suggest you read a bit more of the writings of both men. James, I have read both extensively and have a MA and teach history. I’m not saying that they didn’t believe in a god (they were both deists), but their writing clearly delineates philosophical differences between their views and modern evangelical Christianity. I suggest that if you disagree with any points I have made that you provide evidence. Frank, I will stand “somewhat” corrected, as I did not mean to imply that these great leaders were on the same page as today’s modern evangelical Christianity. I know that many try to say that they were not men of God at all, and that is the farthest from the truth. At the same time, we cannot state that everyone who espouses the Christian values our country was founded upon is a part of today’s evangelical Christians. Frank, regarding your qualifications, I always assume that everyone who takes the time to post a comment is informed and educated, unless the comment is so bizarre that the person does not warrant that respect. So no offense is ever meant by my responses. The ACLU did sue over Arlington cemetery — so they would allow Wiccan veterans to have pentacles on their headstones. They’re in favor of religious symbols on headstones, as long as we treat all religions equally.